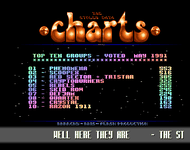 According to Stolen Data 6, the group was formed in Malta in February 1990 with 3 members: Cyber Pirate (packer), Dartagnan The Magician (code, gfx, swapper) and TC (gfx). They worked with other Amiga factions of Axis under the label of Axis Incorporated. In late 1990 they teamed up with Anarchy & Flash Productions to produce issue 6 of Stolen Data.